On Saturday November 14th, I witnessed a traditional Tamo tribal dance and ancient blessing performed in honour of the installation of our new Living sculptures in the sea at the Grand Luley Resort in Manado, Indonesia. I felt moved deeply by the powerful ceremony that called to the sprits of nature to thrive and bless this project. With so much negative global news, I felt proud to be creating an art work inspired by Love. The heart is a strong symbol, a powerful visual medicine and a nurturing of something very positive and creative, which is the core of The Marine Foundation's philosophy. 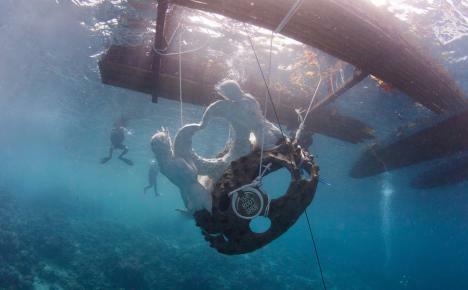 The ‘Love mermaids’ is an artificial reef artwork made to create new fish and coral habitats, cultivating a new marine Eco-system and commencing the creation of an Eco tourism dive attraction that the whole community of Bunaken National Marine Park can benefit from. The Park is a hidden jewel of North Sulawesi’s set within the Celebes Sea and at the heart of the Coral Triangle which is acknowledged globally for its biodiversity. 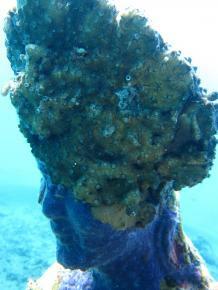 Unfortunately, many of the coral reefs are in poor health, with only 30% in good condition and the rest badly damaged. I believe Eco tourism plays a vital role in long term sustainability for local communities who rely on their seas for their livelihood. 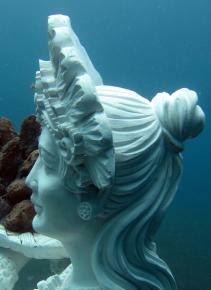 This novel and interactive attraction was sunk in Jalan Masuk, a small bay adjacent to the recently upgrade Grand Luley Resort and are positioned at 12 metres making this an easy and accessible dive. The sandy bottom is surrounded by a lovely coral garden full of soft corals and lots of small fish. These artworks also generate focus in the region and awareness internationally for the promotion of economical and environmental solutions. The governor of the park attended the launch ceremony and word of the event created a buzz that spread to the city of Manado. The Grand Luley Resort, which led the sinking of the sculpture and hosted the media and launch event, has a strong environmental, community and social values that underpin their ethos. As well as having a local employment policy, supporting marine conservation in the region, solar heating system and water recycling, they have preserved the mangrove forest in front of the resort. A less eco-minded hotel may have removed them and created a beach which would soon be washed away. These vital ecosystems are a carbon sequencer and breeding grounds for many fish. The resort has an amazing jetty that takes you through the very peaceful and unique habitat with the waves of the sea gentling beckoning in the distance. 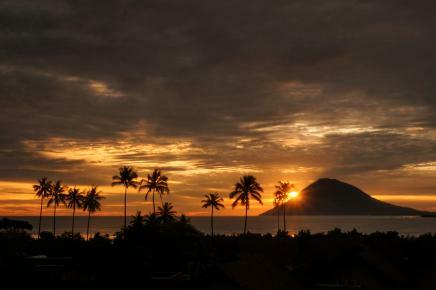 From the jetty the sun sets picturesquely behind Manado Tua, a inactive volcano which has a classic cone shape. During the preparation for this project I have grown fond of this resort with the song of birds as a musical backdrop, the tranquil nature of its green panorama as well as the breath-taking view of the underwater world. The region offers world class diving including stunning coral reef wall dives, full of coloured soft and hard corals, swim amongst turtles or find white tip reef sharks sleeping in their day-time caves. 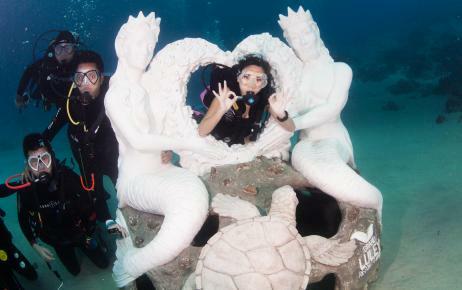 Guests can even take a discovery scuba course with the excellent Grand Luley dive team, and have photos take with the ‘Love mermaids’ to spread some underwater love! 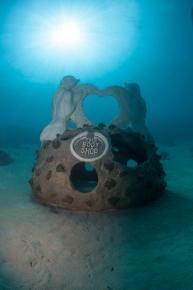 The Love mermaids project was supported by the Body Shop Indonesia and continues the ‘Saving of our coral reefs program” that was started by The Body Shop® and The Marine Foundation in 2013 by the sinking of the ‘Amed Mermaid' statue in Jemeluk Bay Underwater Gallery in Bali.